The plan was to go to Los Angeles for the day to explore a few different and unusual things that we investigated via Google. However, laziness was taking over as on this dreary gray day in Southern California, the warmth of a couch was more inviting. As the morning was slipping away, a few of us decided that we had to get going and seize the day. Los Angeles was out of the question now because it was already approaching noon and L.A. is a two hour drive. 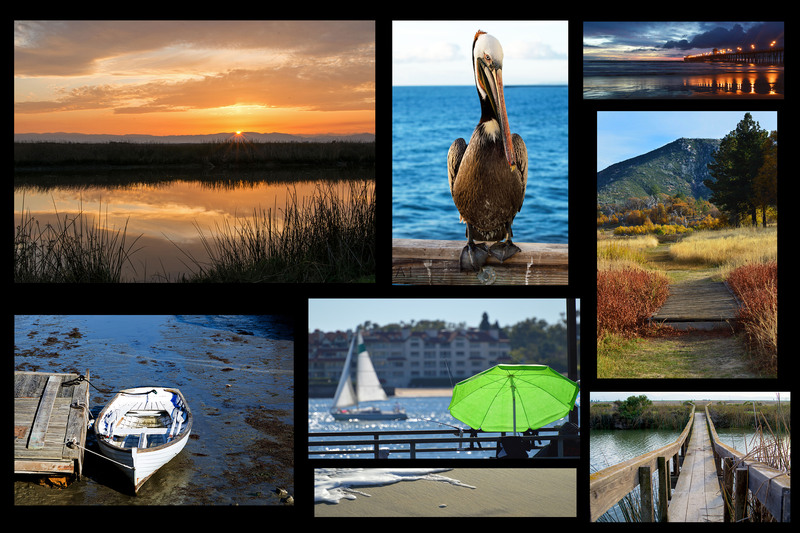 So our trusty search engine found a few out of the ordinary things to do in the nearby San Diego area that sounded interesting. Each one on its own wouldn’t be worth the drive but we bunched a few together since they were all within five miles of each other. 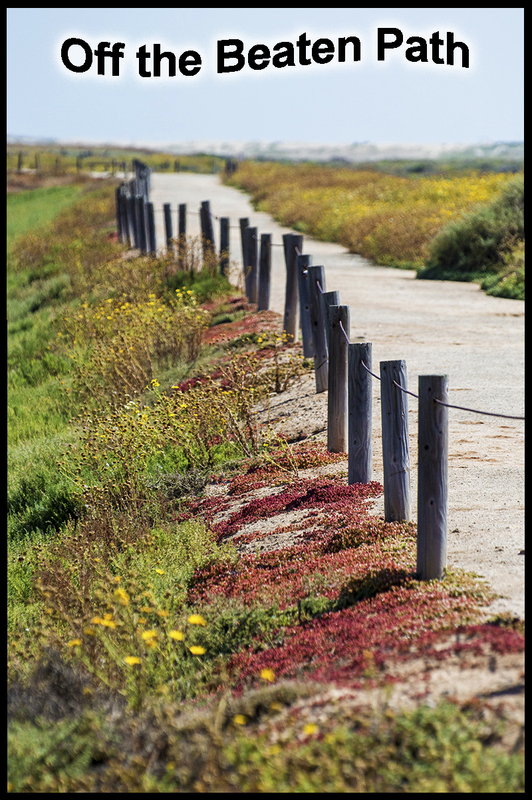 With a plan of action and directions in hand, we set off to visit four unusual things to do in San Diego. On one of the lists we read, it told about a bridge in San Diego that has 488 chimes on its rail that If struck would actually play music. Artist Roman de Salvo and composer Joseph Waters created this unusual musical display by attaching brass pipes over the steel bars of the railing. A song was created by cutting each pipe a certain length to create different notes. These brass pipes fit over the steel bars of the railing so that when you hit them with a stick or metal piece, you could create a musical tone and if done right, play the song. 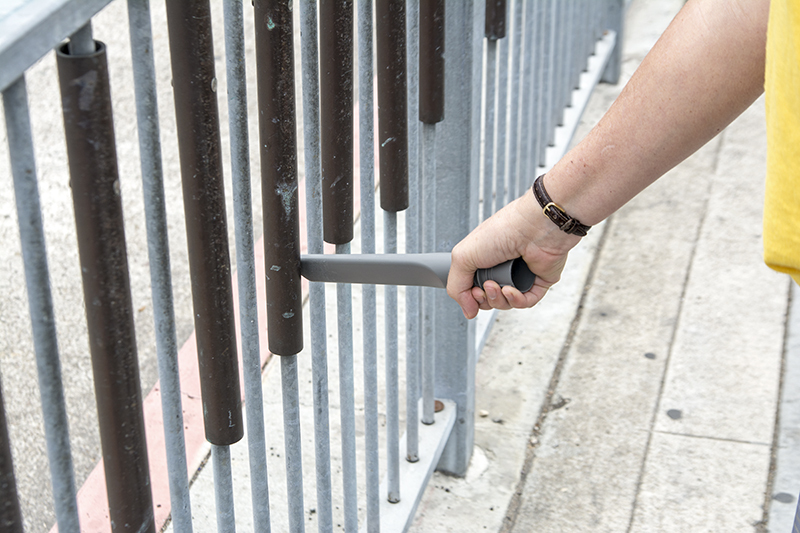 So the information we received said to bring something like a stick or a metal rod as a bare hand wouldn’t work. 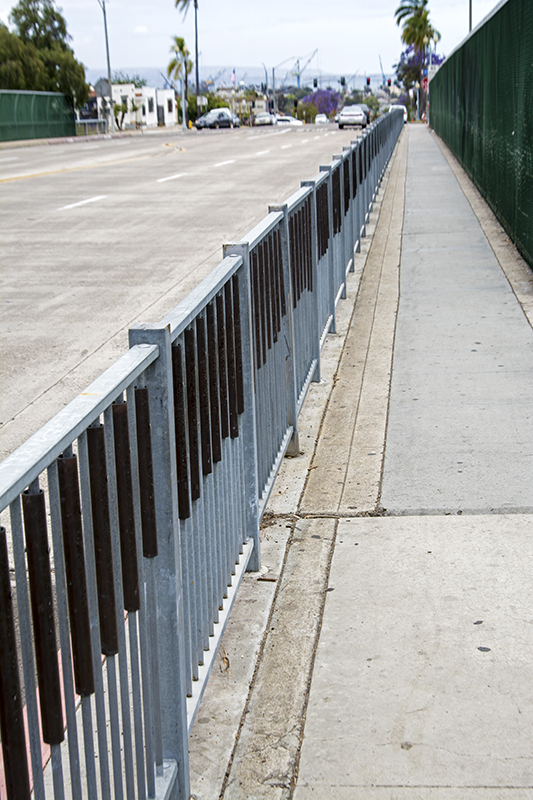 Basically, it is like a giant xylophone in the form of a guard rail next to the sidewalk. On this Saturday afternoon, the bridge was easily found and I asked a passerby if that was the musical bridge since nobody was on the sidewalk. He didn’t know so it made me wonder if we would look stupid going back and forth whacking on the railing. Then I looked over at Staycationer JoJo and saw what she brought to hit against the pipes. It was a hollow plastic vacuum cleaner attachment!! You know the kind you use to get in corners and behind furniture. I thought to myself, is that is all she could find? The bridge was in fact the musical bridge and it sat above a noisy highway which I found odd but as it turns out, I preferred the noise of the cars below over the awful concerto JoJo was playing. Yes I could hear the ringing of the pipes and I am sure with a piece of metal it would sound quite nice. However, the clattering of the plastic attachment overwhelmed the mellow wind chime type ringing coming from the railing. What was supposed to be a pleasing sound was actually, ok, I will say it…annoying. I don’t think the composer had vacumn cleaner attachments in mind when he designed the musical pipes. If you choose to go, you can find the bridge on 25th Street in San Diego near F and G streets. It hovers over the State Route 94 freeway. Take it from me, bring something metal. 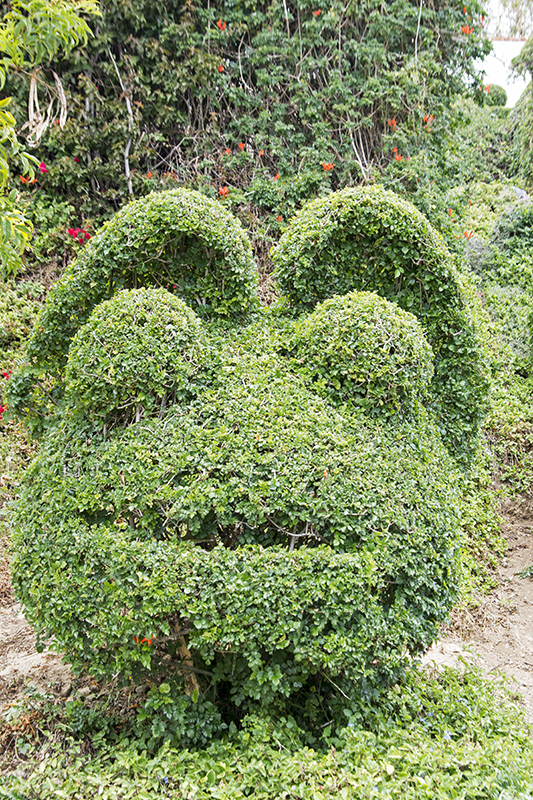 For the past fifteen years, the Harpers have been shaping the bushes or shrubs in their front yard into all sorts of forms including, animals, surfers, dinosaurs, whales, and much more. It is an amazing sight as you drive up the street and see the house for the first time. 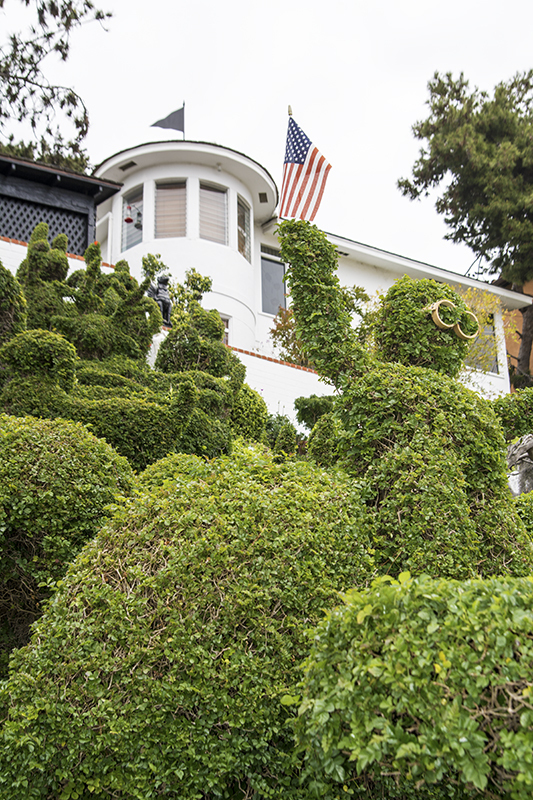 The owners of the home are fine with you getting out of the car to view their yard. I recommend this as you can get a better look at the scene with well over 50 shapes and creations. The only thing they ask is you don’t climb the hill in the yard. I saw JoJo eyeballing a photo op next to one of the figures and a quick reminder of the sign that says ”Please no climbing on the hill”, squelched that idea. She settled for a giant rabbit that was close to the sidewalk. I learned that, Owner Edna Harper doesn’t stop creating and often comes up with new figures to add to the mix from time to time. 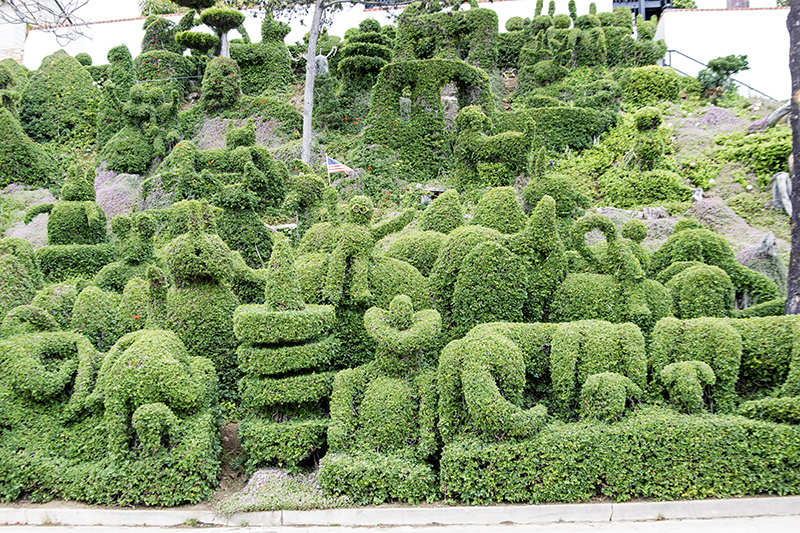 It is an amazing sight and just off of Interstate 5 so it is an easy few minutes to check it out. 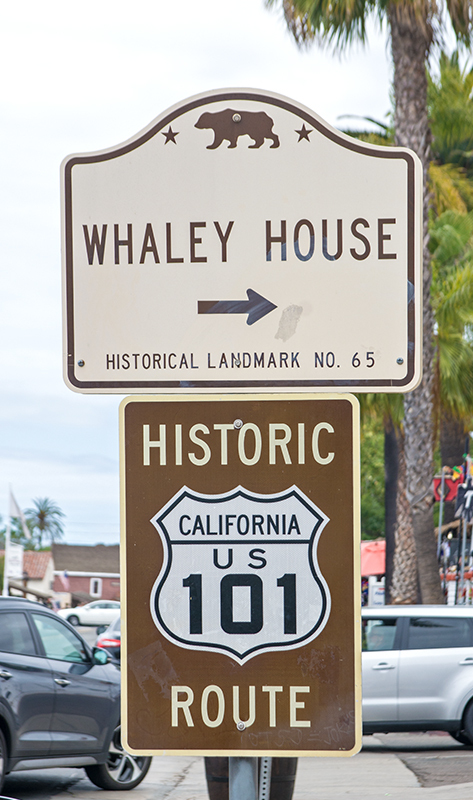 We weren’t sure about the Whaley House but the decision was made for us as we were driving by and a parking space presented itself right out front of the building. Located in the middle of Old Town, the street is packed with people and cars, so finding a spot on the street is rare. Finding one this close was just plain lucky, or was it fate? 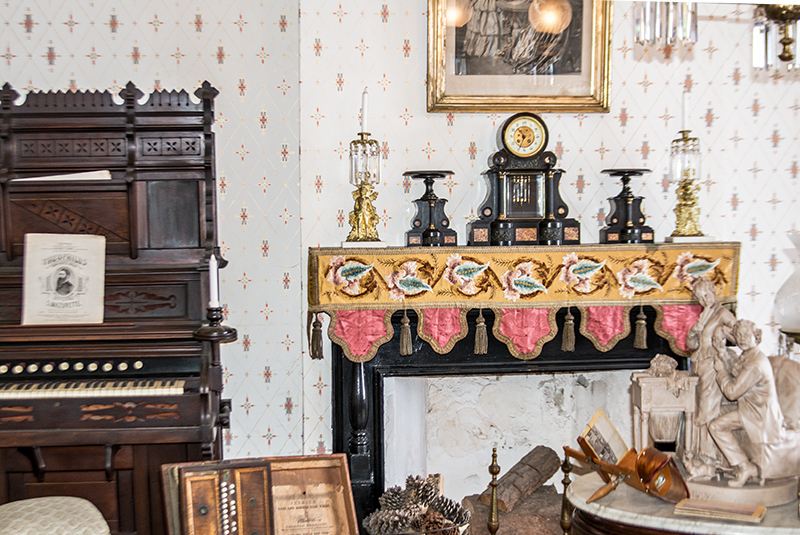 The Whaley House is basically a family residence but was designed by Thomas Whaley originally as a general store. 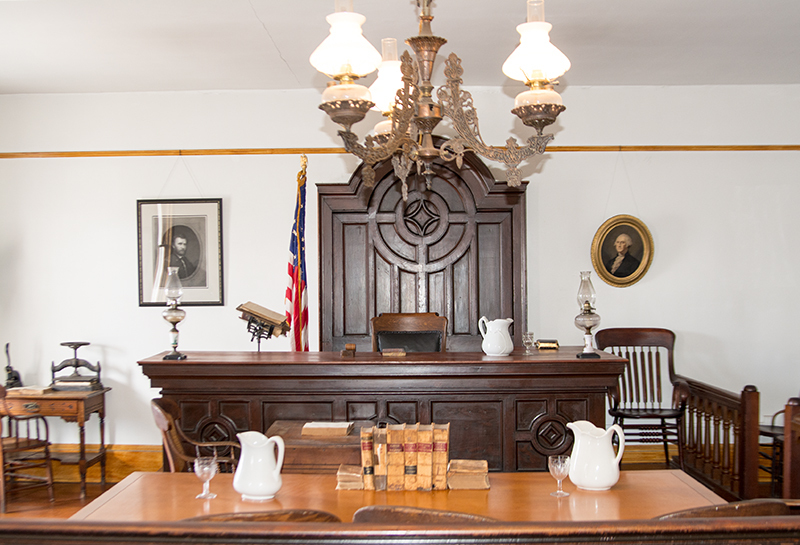 This historical building also housed the County Courthouse, a school at one time, and it was San Diego’s first commercial theater. All of these are on display on the self guided tour as well as the residence itself. Docents were situated near the doors and hallways, to answer any questions. 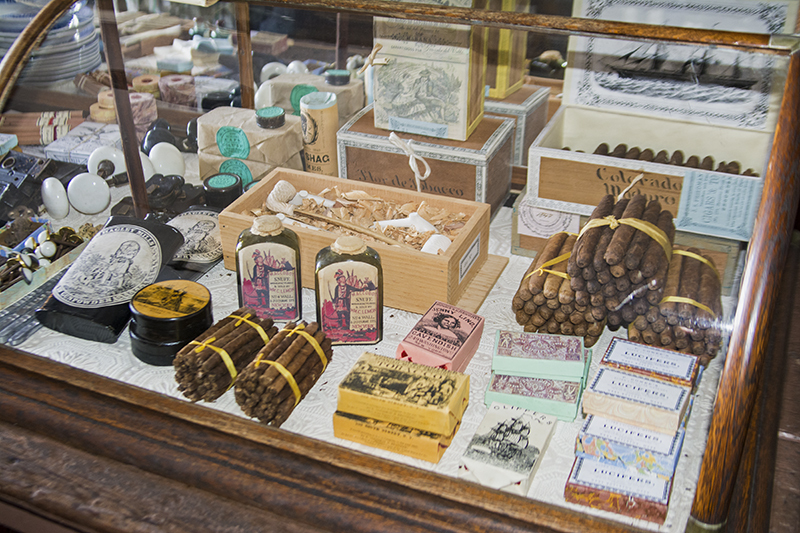 In the store sits an old coffee grinder from 1873, liquor from the day, cigars, and various other ancient items that send you back in time. All the rooms can be viewed including all of the bedrooms, a parlor, the kitchen, and the living room. 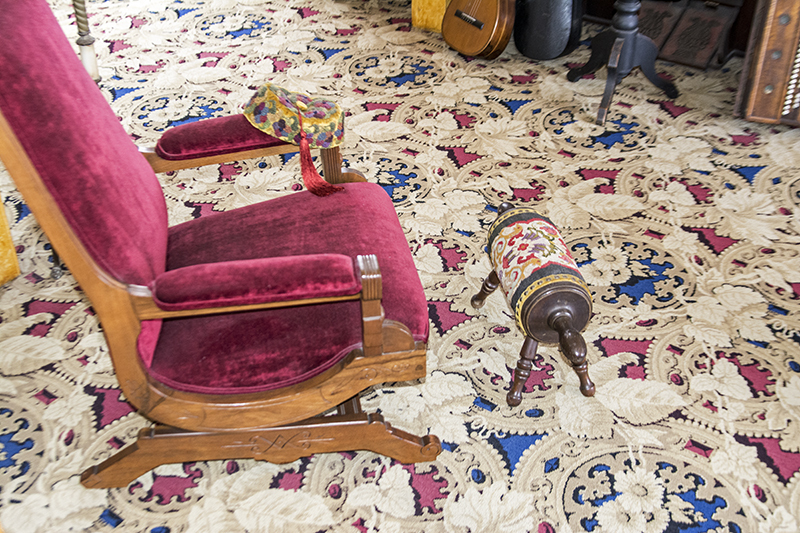 Don’t expect to see the beautiful furnishing of a remodeled home on HGTV, this is from the 1800’s with all the shapes, textures, curios from that time period. When I do a staycation, I love talking to locals and getting their take. We met an interesting lady with a great name(Debbie) and who informed us that she had visited the house many times. We ran into her at the bottom of the stairs where she proceeded to tell us a few captivating tales of the goings- on in the house. 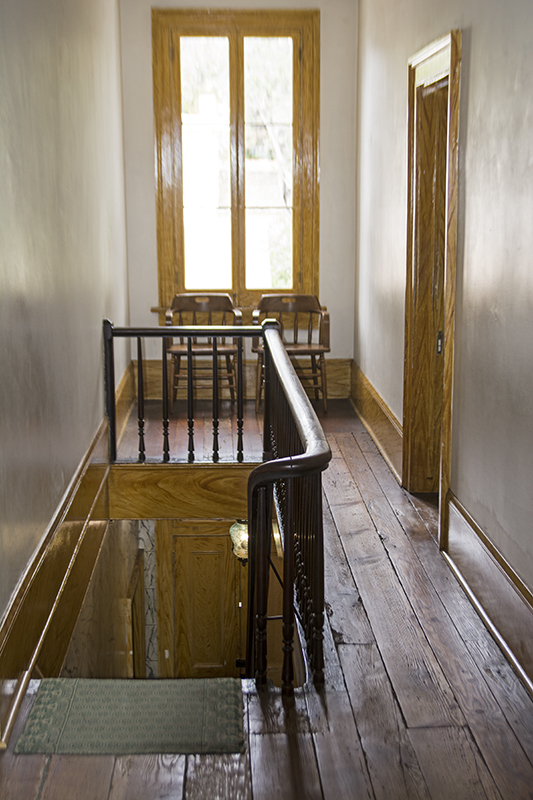 It seems that there is a female apparition, ghost or whatever you want to call her, that stands on the ninth stair and proceeds to push or trip people on their way to the second floor. As it turned out, a few minutes earlier, we just missed a man that was walking up the stairs and guess what? He tripped on the ninth stair! We stood there as we watched crystals on a lamp moving back and forth for no reason while she told us of a day where another lady on the tour, actually got nudged from the spirit while going down the stairs. The shove upset the woman so bad that she immediately departed the house because she reported that she actually felt hands on her back! So what the heck am I talking about? The Whaley House is haunted!!! In fact, according to the Travel Channels’s America Most Haunted, it is the number one most haunted house in the United States. Life Magazine also made this claim. 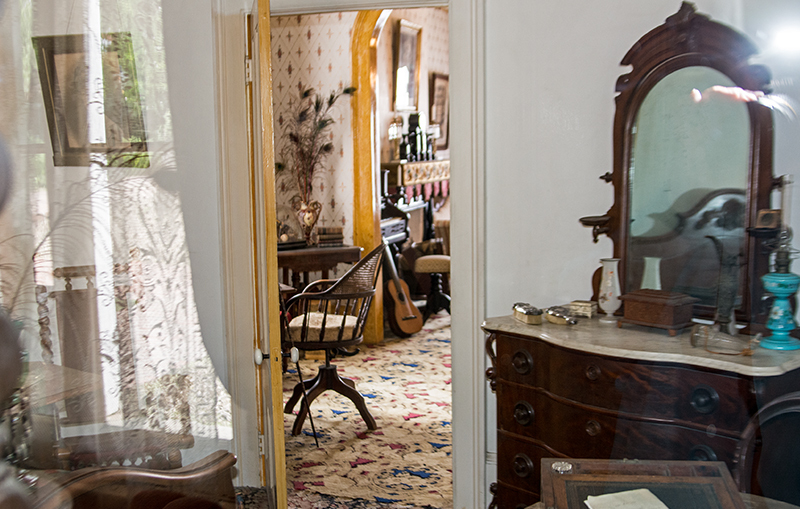 Many visitors have claimed that they have seen presences rooming around the rooms. Debbie told us about kids seeing the family dog and actually taking off after it as it ran out of the room. Of course this dog was never there. She also told us of accounts of people feeling the soft touch of a child taking their hand as if they were her parents. Debbie explained to us that she has sensitivity to this type of thing and let us know that her senses were in a heightened state. I knew nothing about this history, so it was fascinating talking to her. It made it a way more intriguing tour. Even, television entertainer Regis Phelbin told about seeing a floating vision of a woman in one of the rooms and reported that something was definitely going on in that house. 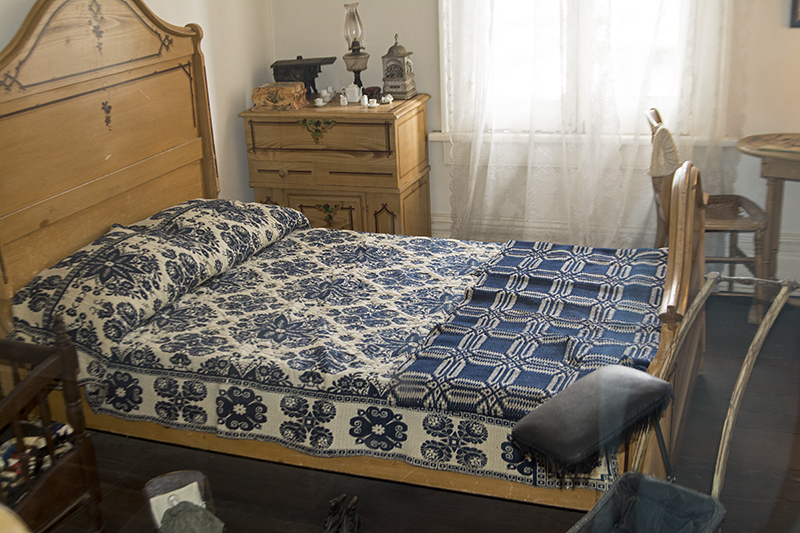 As I researched it later I read of many people seeing and feeling spirits while there, and I guess one of the bedrooms in particular felt a little creepy to a quite a few. I was also told that the kitchen area had most of the ghostly action. I wish I knew about all of this when I first walked in, I might have paid more attention, but then again I have the lowest of sensitivity to this type of thing. A ghost could be sitting in my lap and I wouldn’t know. However, I still find it fun to hear about this and the documented accounts. Whether you believe in spirits or not, it is still a enchanting place that will take you way back in time to an era we could only imagine. Note the décor, note the furniture, note everything, as it all comes from a simpler time many, many years ago. In the living quarters the rooms are taped off or are behind Plexiglas. The staff doesn’t wander in there so if you see anyone in the rooms, well all I can say is… boo. Nothing to fear, just have some fun. 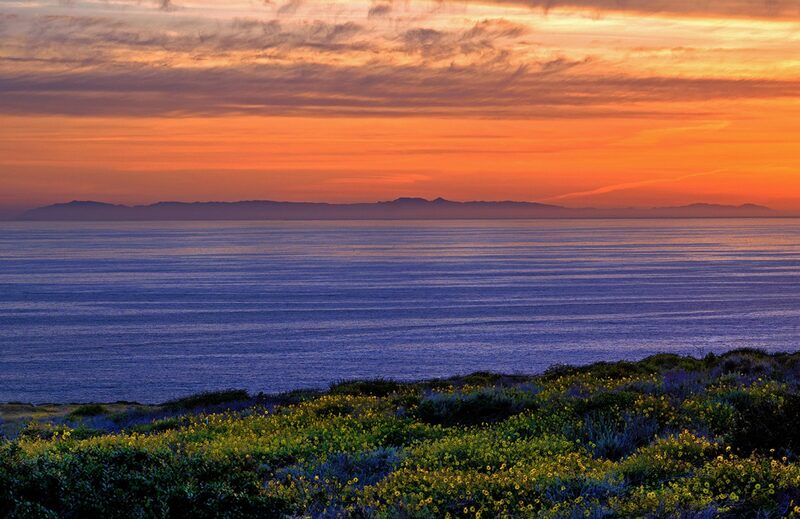 Okay so I misled you on the title “Four Unusual Things to do in San Diego” as this one is a bust. Our activity finder, JoJo, gets a grade of ‘F’ on this one, however, please don’t laugh because she claimed that she heard about this from a few long time residents. 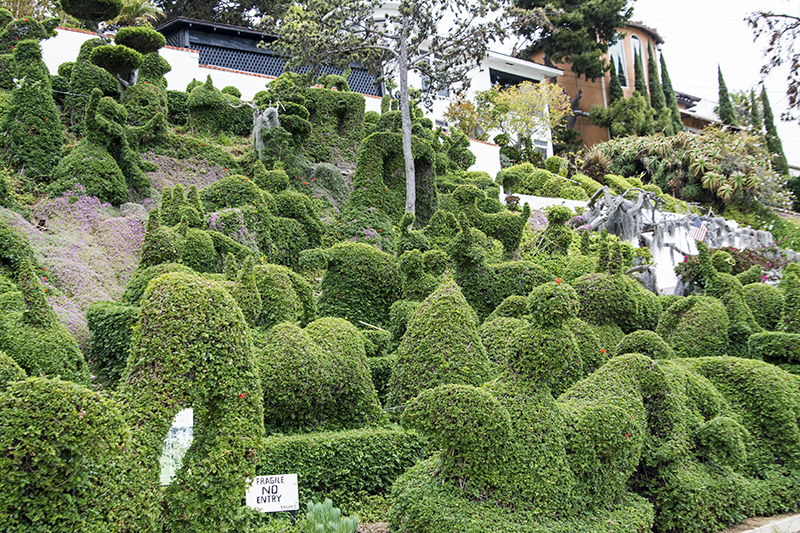 There is actually an urban legend about four houses in La Jolla that were built especially for the little people extras that played the munchkins in the movie Wizard of Oz. Supposedly everything was scaled down to accommodate the occupant’s diminutive stature and this could be viewed by driving by the homes. So on our way north on Interstate 5, us gullibles followed the directions given on Google. We knew there was only one house remaining and it was actually easy to find as it didn’t fit in against the other modern multi-million dollar mansions in the area. High up on the hill with an amazing view of La Jolla, the 1930’s built home at first glance did have the appearance of being smaller. I was skeptical about this whole thing but almost became a believer when I saw the mailbox that was about two feet from the ground. We parked and got out to take a closer look and other than the mailbox, nothing looked out of the ordinary. The roof looked really low but this illusion was because the house was built on a hill and most of it was lower than street level. The doors, windows, fence gates, all looked normal so I was back to being a skeptic. Even though I was thinking this excursion was a bust, I was assured that the history of the Munchkin home would be way more interesting once I investigated the story later. So I couldn’t wait to get back and read more about what we just saw. I always research a place a little before I go, but obviously we didn’t on this one. 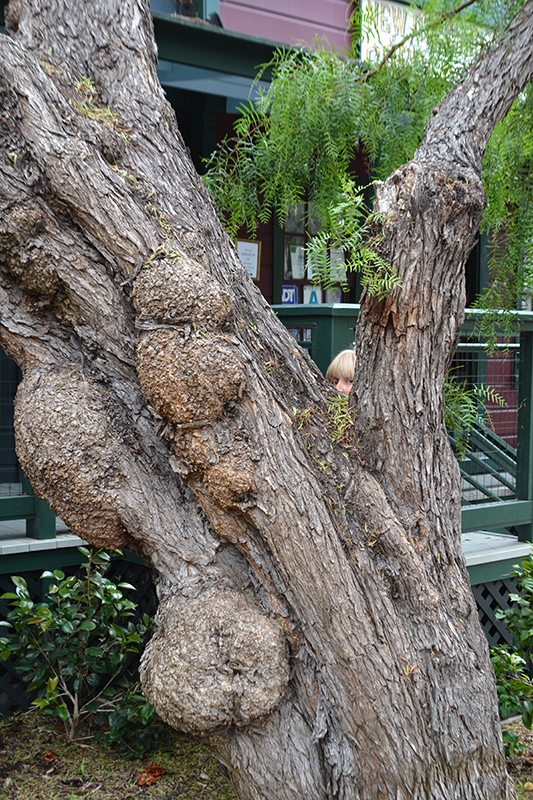 So a few hours later, I pulled out my lap top and searched for Munchkin homes in La Jolla. There were many stories about it and all of them said the same thing… it isn’t true. It is just folklore and a myth. 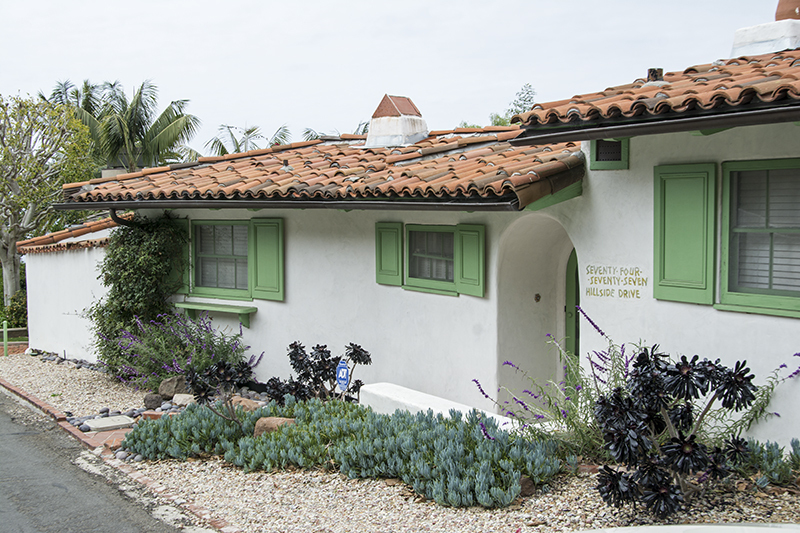 Maybe it all started because L. Frank Baum , the author of The Wizard of OZ wrote portions of the book while he was in San Diego and the movie came out around the same time the homes were constructed. This somehow led to the rumor that the little people lived in the houses during filming. Seems like a stretch but we fell for it. So if you are ever looking for something to do on a boring Saturday or Sunday afternoon, please think about visiting three of the four unique things to do that we mentioned in the story. 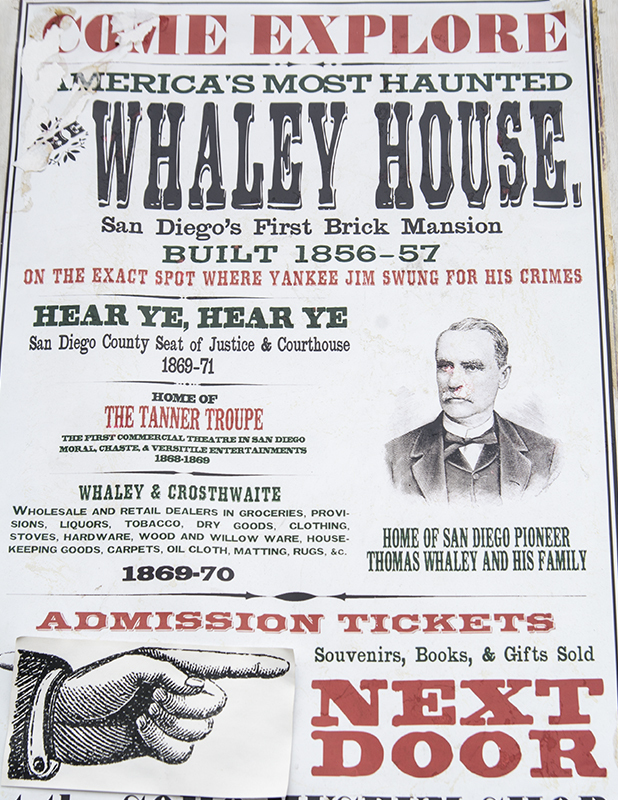 It doesn’t take long and is all free except for the Whaley House which was $8.00 to enter. If you want to see man-made animals, ghosts, and hear a musical bridge, think about visiting all the places above. Bypass the Munchkin home excursion and bring something METAL to the musical bridge and you are good to go. You can always watch the Wizard of Oz if you want to see Munchkin homes.